Millicent Stephenson (Saxophonist) returns to perform her long awaited ‘Not Just Jazz IV’ show with live Band, following a year which has seen Millicent perform widely throughout the UK, feature on BBC1 ‘Songs of Praise’ and release her second CD ‘Reflective Notes’. 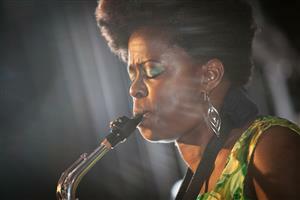 Millicent is a protégé of the late great saxophonist Andy Hamilton MBE. She will again delight the audience with an eclectic mix from her vast musical repertoire of self-penned and iconic Jazz, Reggae, Gospel and Blues numbers rendered in her unique style on.